From Monday 16th June - Sunday 29th June players will have a chance to win a £500 holiday voucher. Gain one entry to receive one draw for every £20 wager on bingo and/or slots in the last 2 weeks of June. Win a Trip to Brazil! You have until June 8th to win and all expense paid trip to Brazil! It's a promotion to celebrate the launch of the new Football Star Slot. The winner will be announced on June 12th! Bingo Starr has £1,000 of amazing Summer Holiday-themed prizes in his big game which plays on Wednesday 30th July at 10:30pm! There’s a holiday to Butlins, a Merlin Family pass and Leisure Vouchers there for the taking! You just gotta be in it, to win it! Throughout July, enjoy a weekday Slots & VP Face-off tourney and on the weekend, from Thursday to Sunday, a tourney with double cash prizes and a chance to win a Cruise Trip for two. Enjoy $1,000 Slots & VP Face-off tournaments every Monday to Wednesday. You simply purchase your seat(s) and compete for the highest posted score. Pack your bags, grab your sunnies and get ready for the trip of a lifetime with Kitty Bingo. When: 8 weeks, each week brings a new destination and prizes! Reward: Win a £2k holiday and weekly prizes! 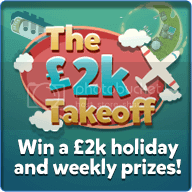 Free cards for the £2k Takeoff promotion can be earned from Thursday 10th July 00:00 to Wednesday 3rd September 23:59. City Cat’s in Paris in July and he’s giving away one very magical prize worth over £1,000 – a trip to Disneyland Paris with hotel and travel included! The big game plays on 31st July at 9:30pm, and cards can be earned for free by playing slots! There’s also a Slots Leaderboard challenge with £300 up for grabs! Win a Trip to Australia's Gold Coast! Celebrating the exclusive I'm A Celebrity... Get Me Out Of Here Slot players have a chance to win an all-expenses paid trip to the home of I'm A Celebrity, Australia's Gold Coast! 7 nights stay in a 4* hotel, week commencing 1st December 2014. I'm a Celebrity... Get Me Out Of Here! experience day including a trip to the set and Bushtucker Trial Experience. Helicopter tour of the Gold Coast. Rainshower Spa experience for two. Lunch for two in the Palazzo Versace. All transfers, Visas, insurance etc. For a chance to win play the I'm A Celebrity... Get Me Out Of Here! Slot and get a star for every £10 paid out in winnings. A Bush Tucker Trial Challenge. Bush Tucker Trial selection box. But hey you only have until Sunday November 23rd, 2014 soooooooo get to spinning! A Free Caribbean Cruise for 2! To qualify redeem all the seven codes before December 31st, 2014. A minimum $50 deposit is required to claim a Bonus. Theses Bonuses have no max Cashout and each code can only be redeemed only once. Playthrough requirements: 3x for Bingo, 30x for Slots & Keno and 45x on all other allowed games. To celebrate the new Cricket Star slot a the chance to win a trip to Australia to watch the final cricket event of 2015! Simply €20 on Cricket Star between Wednesday 4 February - Monday 2 March 2015 and get one entry into our Cricket Star Promotion Draw. One lucky winner of the draw will win an all-expenses paid trip to Australia for two to watch the final of the cricket tournament which takes place at the Melbourne Cricket Ground, Melbourne on Sunday March 29 2015. The draw will take place on Tuesday 3 March 2015 at 10am CET and the winning player will be contacted by our Customer Support team. Want to be whisked away on a wondrous dream holiday? Enter now! You could win a European holiday so get in on this special opportunity. Win a luxury trip to Dubai for two, one of three VIP sporting experience days or one of 10 Samsung Galaxy tablets. Simply play from now through 26th April to earn unlimited tokens, then trade them in and enter the prize draw of your choice. £10 staked on Bingo or £5 wagered in selected Bingo rooms: Kiss & Tell, The Catwalk, Super Star Bonanza, Bargain Bingo, Mojo Lounge and the Auction House. Full House win in the Auction House room from 11:00 until 17:30 UK Time and for every one-line, two-line and Full House win from 20:30 UK Time each day. 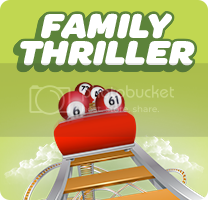 Featured Chat Game win in bingo rooms. £20 staked on Slots and Scratchcards or £10 wagered on Featured Slots: Sevens High and Sinbad. Earn more tokens when you play on Booster Days. The next takes place on 1st April, where you can earn one token when making your first deposit of £10 cash or more. Collect your tokens now, then trade them in during submission week from 27th April until 3rd May to enter the prize draw of your choice. Get your hands on a 7 night family adventure to a blockbusting theme park in Orlando, Florida! Simply play a minimum of £10 on Bingo, £30 on Slots or Slots Mini Games, £30 on Instant Win games or £30 on Casino games between Monday June 1 and Sunday June 28 to earn an entry into the weekly Prize Draw. Winners will be announced every Monday. Enjoy fun in the Florida sun! New June Challenge – Summer is here and it’s time to go on a Caribbean Cruise! Play the hourly Cruise Ship patterns in the summer bingo room and win Cash Prizes and a Cruise for 2. This challenge is about a week long so it’s better to start playing these special patterns sooner than later. 6th – 10th place winners get $50 Bonus Each! Win a magnificent trip to Egypt and more! Unearth the wonders of Cleopatra for your chance to experience the Pyramids on a luxury Egyptian holiday! Simply opt in and play £30 on Cleopatra between Monday 20th (00:00) and Sunday 26th July (23:59) and for every day you play you’ll earn 1 entry into the prize draw. Plus, they’ve got 10 golden cash prizes of £25 to give away every day! Win a treasured Egyptian experience!